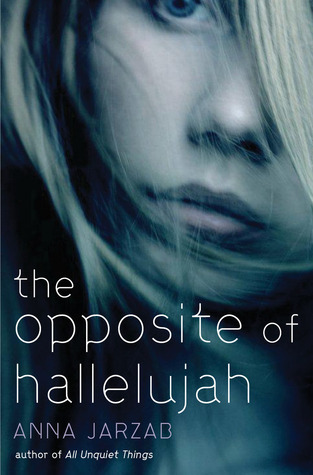 Verdict: How many teen novels can you think of that explore the spiritual concept of “grace”? Or indeed address matters of spirituality at all without seeming, well, preachy? The Opposite of Hallelujah is unique in that it takes a teen’s spiritual development as seriously as it tackles issues about a teen’s romantic and family relationships. This is not a perfect book, but it thematically is a refreshing one to read. Perfect for: Thoughtful readers who want realistic fiction with a unique perspective and plot. Readers who like reading about family relationships as much as they like reading about dating. Summary: Eleventh grader Caro is a dedicated student who, after a rocky time in middle school, finally has established a good reputation, good friends, and is even starting to party and date some boys. But she feels that her whole world is threatened when she learns that her 27 year old sister, Hannah, is returning to live with her family. Caro barely remembers her sister, because eight years ago, Hannah entered a reclusive convent many miles away. She resents that this almost-stranger will ruin her family dynamic, and also feels a vague shame that her sister chose to do something so “weird” as to become a cloistered nun; Caro also has no idea what led Hannah to be a nun, or why she is suddenly leaving the convent, and her parents aren’t really talking about it. What Caro wants to concentrate on more is her social life, and in particular her romantic life, and she’s willing to tell a bunch of stupid lies to everyone she cares about to keep Hannah’s return a secret. From the beginning of the book you get the sense that Caro is a bit of a brat and has been using her pseudo only child status and her solid grades to see what she can get away with with her firm but loving parents. Caro, the book’s narrator, complains about and to her parents, and through the course of the book even rebels against them, but you can tell that she truly respects them and wants them to be proud of her. There are too many YA books with absent or abusive parents, so it was good to see loving parents with a sense of humor and high expectations for their daughter. This book faked me out! The inside flap of the book lets you know that Caro’s lies about Hannah might jeopardize her relationship with her boyfriend. At the beginning of the book Caro is maybe-sorta-dating-but-not-really-sure this boy named Derek. It’s summer, and he’s at camp, and not returning Caro’s texts, so she’s not that confident about the relationship. I thought the “boyfriend” of the book was going to be Derek, but early on in the book there is a painfully hilarious scene where Caro realizes Derek’s not that into her, and tries to dump Derek before he can dump her, but it doesn’t exactly go as planned. Then soon after a new boy named Pawel attracts her attention and vice versa. Pawel is new, but he’s no mysterious loner dude – he’s charming and friendly and honest. I loved Pawel! In fact, it is Pawel’s honesty and Caro’s lies about Hannah that end up creating conflict. At last! A legit reason to have romantic conflict in a YA novel! (I’m so glad Pawel didn’t turn out to be a demonic angel). Even though Hannah returns home in an emotionally and physically frail state, Caro’s resentment leads her to be biting and sarcastic to both her parents and Hannah. Caro also tells lie after lie to her friends and maybe-sorta-boyfriend so that they don’t find out about Hannah, because Caro doesn’t know how to explain about her sister and wants to keep pretending that Hannah doesn’t really exist. Eventually Caro’s bad attitude and lies catch up with her, which forces her into some soul-searching. Although raised a Catholic and sent to a Catholic elementary school, Caro has not felt particularly connected to her religion and has been completely uninterested in ideas of spirituality. While academically solid at school and for the most part obedient to her parents, Caro is more interested in social status and partying and boys than she is in religion. However, during the course of the book, Caro starts dropping by to talk to local priest Father Bob because he seems like the only one to whom she can ask questions about Hannah. Father Bob counsels her obliquely, by sharing some of his thoughts on science, philosophy, and yes, spirituality. But there is no lecturing and no easy advice for Caro; she alone must figure out how to bring grace to herself and her family. I have to admit that when Caro first started dropping by a priest’s office by herself I was nervous that something inappropriate would happen, given all the stories in the news and the propensity for contemporary YA to traumatize its readers. I’m so glad it didn’t. I loved Father Bob! Oh, Caro – you are both so frustrating and yet so sympathetic. She really is quite bratty at the beginning of the book, but not to the point that you wonder how she has friends. I also love that Caro takes pride in doing well in school and challenging herself academically. There’s a side plot where she is forced to participate in a science fair and takes on an advanced project, even though a) the experiment is far above her abilities and b) her science fair partner is Pawel, who at this point in the story has been giving her the cold shoulder because of her lies. I just love that Caro’s stubbornness translates into attempting to be a badass in science. It was also interesting that you couldn’t really pigeonhole Caro into one of your standard high school types: she’s brainy, but not a nerd – she goes to parties and drinks. She’s not a troublemaker, but gets herself into trouble during the course of the book. It’s cool to see her change her outlook as she works her way through the repercussions of Hannah’s return and of her own disastrous lies. She really is a good person inside, and you can tell it’s in part because she has parents who tried to instill good values in her. As Hannah gets weaker and more withdrawn after her arrival home, you keep wondering: What happened to Hannah? Why did she become a nun? Why did she leave the convent? Why won’t she talk to anyone? As a reader, I made a lot of predictions, and they were far more interesting than the truth that Caro finally reveals. I mean, Hannah’s secret is definitely pretty heavy, but it seemed a bit melodramatic that what she experienced would cause her to take the actions that she did*. I think what Jarzab was really getting at was that burying the truth is unhealthy and that it’s important for families and friends to be able to talk about things honestly. No doubt! I really liked that this was a theme, but I felt like the actual secret and its aftermath were handled more melodramatically than realistically, especially since (mini-spoiler) Hannah really didn’t need to atone for any wrongdoing on her part. I guess I would have bought Hannah’s sadness and withdrawal more if (mini-spoiler) she had actually done something wrong, or at least something more ambiguously amoral that what her secret turned out to be. This entry was posted in Contemporary - YA, Full Hack and tagged Parents, Psychological, Sisters, Spirituality by lithacker. Bookmark the permalink. I’ll have to look for this book. I read Anna Jarzab’s first novel and didn’t quite love it, but it was clear that she’s a thoughtful and interesting writer. This one sounds more like my kind of thing … and I’m curious now to find out. Last year a bunch of my students who like thoughtful teen fiction graduated and it’s been difficult to match all these kind of quiet books with readers…although I have a couple of students in mind. it’s one reason I do this blog. ..to try to match great books with great readers!